together " during NAAA's opening luncheon on Wednesday, Nov. 14. Following his presentation, Mulally will be joined on stage for a moderated question and answer session by BSC America Chairman and CEO Ray Nichols, KAR Auction Services CEO and Chairman of the Board Jim Hallett, and Cox Automotive President Sandy Schwartz. The 2018 NAAA convention, held in partnership with the National Remarketing Conference's Used Car Week Nov. 13-16, will meet at the Westin Kierland Resort in Scottsdale, Arizona. "We're honored and thrilled to have someone of Alan Mulally's leadership caliber and business acumen in the industry deliver our keynote address," said NAAA Chief Executive Officer Frank Hackett. "The Ford Motor Company has been a loyal member of our association and has graciously sponsored a vehicle for NAAA presidents to use as official transportation during their annual term." Mulally led Ford's turnaround from a company on the brink of bankruptcy to one of the world's leading automakers. He guided the Ford team in working together on a compelling vision, comprehensive strategy and relentless implementation of the One Ford plan to produce profitable growth for all of the multinational corporation's stakeholders. Due to his management, Ford was the only major American car manufacturer that did not ask the federal government for a bailout during the Great Recession. 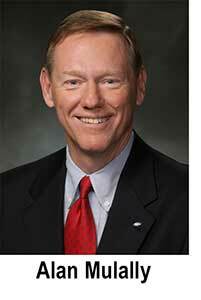 Prior to joining Ford, Mulally began his professional career with Boeing in 1969 right out of college, having earned Bachelor and Master of Science degrees in aeronautical and astronautical engineering from the University of Kansas. He later received his master's in management from the Massachusetts Institute of Technology as a 1982 Alfred P. Sloan fellow and continued to rise up the ranks, becoming executive vice president of The Boeing Company, president and CEO of Boeing Commercial Airplanes and president of Boeing Information, Space and Defense Systems. For his achievements there Aviation Week named him its "Person of the Year" in 2006. Throughout his career, Mulally has received public recognition for his industry contributions, executive leadership and service, including being named #3 on Fortune's "World's Greatest Leaders" list, one of the 30 "World's Best CEOs" by Barrons, "Chief Executive of the Year" by Chief Executive magazine, one of TIME's "The World's Most Influential People," and "Industry Leader of the Year" by Automotive News. He has also been honored with the American Society for Quality's medal for excellence in executive leadership, the Thomas Edison Achievement Award, the Automotive Executive of the Year Award, and with induction into the Kansas Business Hall of Fame. Mulally served on the U.S. Export Council, co-chaired the Washington Competitiveness Council, and sat on the advisory boards of NASA, the University of Washington, the University of Kansas, Massachusetts Institute of Technology and the U.S. Air Force Scientific Advisory Board. He is a member of the United States National Academy of Engineering and a fellow of England's Royal Academy of Engineering. He is a past president of the American Institute of Aeronautics and Astronautics as well as a former president of its Foundation, and a past chairman of the Board of Governors of the Aerospace Industries Association. Currently, Mulally serves on the board of directors of Alphabet Inc. (parent company of Google), Carbon 3D and the Mayo Clinic. Now in its 70th year, NAAA is a private, nonprofit trade association representing a membership of 342 wholesale auto auctions in 47 states, Canada, Puerto Rico, England, Australia and Japan, as well as 134 associate members from a wide range of industry related fields. In 2017, NAAA member auctions conducted weekly sales of all types of motor vehicles totaling 10 million units worth $105.6 billion.